Please Note: This is an imported, natural product and could possibly be ink stamped in some areas, have seams, or other inconsistencies. For a more refined fabric, please see our colored burlap selection. Not Hydrocarbon Free. Quality 7 ounce burlap fabric at a discount price. Medium weight and weave for a wide range of general purpose projects including shrub wrap, curtains and backdrops. 40" width, sold by the yard, with substantial bulk discounts. Hope it will work as theatrical masking when painted. I am using this for costumes. I orginaly pick another burlap. You are the only company that I really like your 7oz. open weave burlap for my bee skep project. Love the texture perfect for the placemats at our daughters wedding reception. Going to slightly hit them with white spray paint to dress them up just a bit. And best of all the price is perfect have a lot to make!! Will be cutting this into sashes for chairs. For tree wrapping and gardening purposes. Great price for what I needed, couldn’t be matched anywhere. Ordered this because of the price. Will use to wrap shrubs in the garden. I bought this burlap to protect the new plantings I've put in at our new property. I am making disposable liners for my riding mower grass catcher in order to keep the sticker burrs out of the mesh bottoms of the catcher. To cover my plants in the winter. I looked around at other store's prices and found this to be the better one, and the quality looked good! I hope it is as explained and then I will be very happy! I am using this for rustic wedding reception. I chose this material as part of my wedding decorations. It is versatile for different needs. needed it for my garden. good price! I am making a "swampy" look for the show "Shrek Jr."
I selected the 7 ounce burlap to use for covering plant material in the winter. BEST ANSWER: This burlap is 40" wide. Can I use this over grass seed area? BEST ANSWER: You could, but this product is not hydrocarbon free. It may contain chemicals that can run off in rain water that may affect the growth of your grass or other greenery. I would thinks so. I used it for covering straw bales at my daughter's wedding. Can I use this for Wedding reception tables ? BEST ANSWER: You can use this for tables. This is an imported, natural product and could possibly be ink stamped in some areas, have seams, or other inconsistencies. For a more refined fabric, please see our colored burlap selection. This is not Hydrocarbon Free. BEST ANSWER: Think it would work great. Minimum fray. how much in running feet does this work out to be since it is 40" wide? BEST ANSWER: Do you mean square feet? 1 yard of the 40" wide burlap is 10 square feet. The running or linear feet depends on how many yards you get, with 1 yard equalling 3 feet. does this have an oder? I need 3 rolls 100 yards of burlap, does it come in 100yd.? BEST ANSWER: Yes, but you may want to talk to our customer service when you order to make sure you're getting it cut how you want. There may be a small fee to get special cuts. Contact our customer service at either help@onlinefabricstore.net or 877-781-2967 Monday - Friday, 9am - 5pm EST. How do you clean this fabric? BEST ANSWER: You can spot clean with mild soap and water. Are any chemicals added in processing? If so, what chemicals. BEST ANSWER: This burlap is made with mineral oil, which is a petroleum based product. Hydrocarbon free burlap is made with vegetable oil instead. Our 10 oz burlap is hydrocarbon free. How much material must be bought to qualify for bulk discount and what is the price of the bulk discount? BEST ANSWER: There are many levels of bulk discounts for this product. See the 'Buy More & Save' section under the price. I'm looking for burlap to cover three picnic tables (butted together in a row) for a family reunion dinner table. Which burlap do you suggest? What are the approximate sizes of the bolts? BEST ANSWER: This fabric is 40" wide and is sold by the yard. If you require a substantially large quantity, please contact customer service prior to placing your order to ensure we can fulfill the order. What does hydrocarbon free mean? BEST ANSWER: Burlap is typically made using mineral oil, which is a petroleum product. This gives it a kerosene-like odor. Hydrocarbon free burlap is made with vegetable oil instead. Is this fabric heavy enough to protect citrus trees from frost? BEST ANSWER: I can't say regarding citrus trees, but I used it to wrap Dwarf Alberta Spruce to protect them from winter sunburn in Maine. So, it is a fairly heavy fabric, given that it stands up to New England winters. I’m needing 13 yards. Does this come in a continuous roll? Can this be dyed brown? 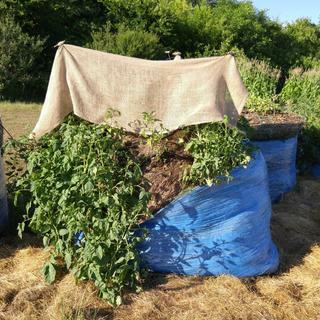 I use burlap to shade my raised beds made from 4 x 6 round hay bales. It is perfect. I bought this for gardening, mostly covering carrot seed and grass seed. it's perfect for that sort of use. It's rough and sheds fibers so you might not want it for decorating or crafts. Nice loose weave, great texture. Delivered on time and looked great at a baby shower!